Oh, the sights you see when you're cruising the back country roads around Nashville. 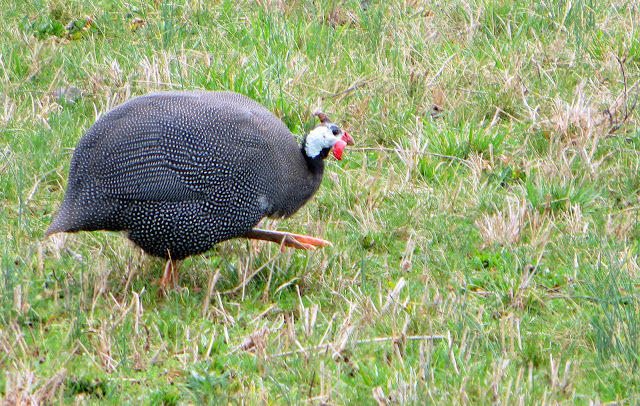 This beautiful little bird - the Guineafowl or Guinea Hen as it's known - was cruising down the side of the road with a bunch of his other friends when we drove by. I was immediately intrigued when I saw him and asked Ed to go back because I wanted to see what it was. When the car creeped closer to him he darted under the fence and back into the field so I had to snap this photo while he was moving. I'd never seen this kind of bird before. I thought it was a ptarmigan because of the spots, Ed pegged it correctly as a guinea. "Who are you calling a guinea??" Then I Googled for more info. Apparently, they're easy to raise and they're delicious. 2011: Extra! Extra! Read All About It! Yes, they are delicious. I was tricked into dressing and cooking one by being told it was a wild turkey...(I knew it wasn't, but he who brought it home, had to eat it).